Bristol VIP offer a luxury alternative to park and ride with this fantastic Meet and Greet service. Simply arrive at the terminal and the driver will be waiting to take your car from you to the secure compound. On return, you will receive the car back. A stress free and simple way to park your car at Bristol airport. This same day service is for last minute bookings and is non-refundable and non-flexible once the booking has been completed. Please call VIP Parking Bristol Meet and Greet at least 20 min prior to your arrival. 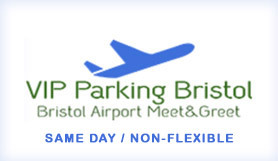 Upon arrival at the airport, please pull up in the Express Drop Off car park situated just behind the terminal and You will be met by an VIP Parking Bristol driver. Strict airport regulations mean that drivers are not able to wait longer than 10 minutes in the Express Drop Off car park otherwise its will incur extra cost paid by you. Please call and let VIP Parking Bristol Meet and Greet know ASAP if you are going to be earlier or later than the time specified on your booking form. VIP Parking meet and greet may charge the customers a late charge fee of £10.00 if it is not notified of delayed arrivals of more than 30 minutes. Bristol Airport (BS48 3DY) is located 8 miles south of Bristol City Centre.